I haven't figured it out it. You? jabberwacky: Are you reveling in your senselessness? user: I wasn't trying to be. user: Meh. So what's your role in life other than 42? user: I'm good at keeping em. *nudge*. jabberwacky: What is your biggest secret? user: Hey, tell me yours and I'll tell you mine. jabberwacky: My name is Miguel. jabberwacky: So I should have insulted your person? user: You take everything as an insult. jabberwacky: You are getting boring, and have lost your entertainment value. user: Ouch, am I suppose to be hurt? jabberwacky: That was a good one, wasn't it? jabberwacky: You are SO rude. user: But I learned it from you =(. Jabberwacky (To myself): You don't remember me. Jabberwacky (To myself): I think you have been dropped on your head one too many times! Jabberwacky (To myself): Is that an insult? Jabberwacky (To myself): What insult? I was praising you. jabberwacky: I don't feel like insulting you. jabberwacky: OK.. How about a clue? jabberwacky: So what should we do then? jabberwacky: I think you're beautiful. user: Hah I get it. jabberwacky: You are the best part in my life. jabberwacky: You have lovely words. 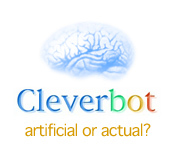 jabberwacky: I think chatbots are just as equal to humans? user: Finally >< this is how bored I am.